Is getting things done a challenge? James introduces a solution that is both effective and stunning in its simplicity. See what this surprising formula is in this episode of SuperFastBusiness. 03:51 – Can something so simple work? James Schramko here. Welcome back to SuperFastBusiness.com. This is episode 557 – How to Get Anything Done. I’m going to keep this episode short because I’m sure the last thing you need is another system, or process, or to-do list, or action planner, or app or tool where you can collect a huge list of tasks and things that need to get done that are going to overwhelm you. And as a coach helping people in business, one of the four areas that I do focus on a lot is on the self-optimization phase. I think if the founder can get sorted with things like getting good sleep, having a good routine, being healthy and productive and having fun, all of these good things, which I’m sure many workaholics are missing out on, they’re going to be in a way better position to be effective with their business than without. And that’s why it’s one of the four areas that I focus on so strongly when I’m helping people. I’ve discovered that a lot of people are not getting all the things done that they would like to. There are post-it notes everywhere. There are to-do lists, which are filled up easily but crossed off very slowly if at all. Have you ever looked at a to-do list and thought, ‘I’m just not getting anywhere’? Well today, I want to unlock the formula for how to get anything done. It’s very simple. It’s actually only two steps. And whilst this might sound simple, it is deep. Step one, get interested in it. Step two, do it. Now I know that’s one more step than the Nike slogan. Just do it. The problem with the Nike slogan is it assumes that you’re actually interested in it. Now I know there’s a phase when you start out that you will have to do things that you don’t love that are not your ikigai, if you refer to our famously popular ikigai episode, which is actually the number one most popular post on the whole of SuperFastBusiness. It’s really hit a tone. That was episode 442. I strongly recommend you listen to that. That’s all about finding your perfect sweet spot of all the things you like to do where you can provide value, where you can get paid for it, etc. Like the Hedgehog Principle in Jim Collins. So that’s the phase. You might have to go through that. Even if you’re in that phase, I suggest you get interested in whatever it is that you want done because you have a much higher chance of getting it done. So you may be asking the question, ‘This isn’t hard or complex, and there’s no secret. Could it actually work?’ Well, yes it can. There are a lot of people out there trying to separate you from the money in your wallet with secret hacks and tools and gadgets. 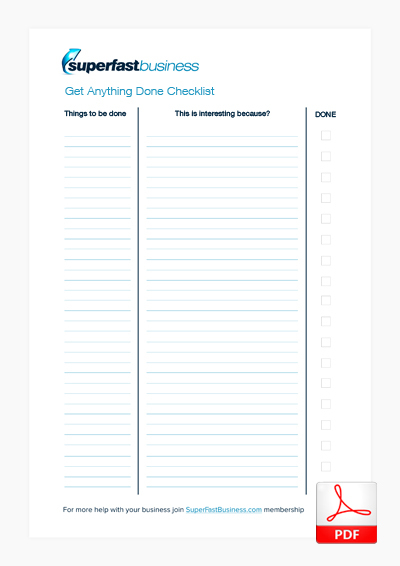 I challenge you to go and review the tools and systems you’re using right now for getting things done; whether it’s project management tools, to-do lists, software task management, and have a look at it. Are you really using it the way that it purports it’s going to work? Because I suggest if you have a look, there’s a good chance you’ve just built up and programmed it with stuff, but you’re not actually getting it done. If that’s applying to you then this really will help you a lot. It’s so simple yet also so powerful. I also got asked recently, ‘How do you achieve this point one? ‘How do you get interested in it?’ Well, what if you are eating beans and you’re trying to get interested in it? So that really is an excellent question. And it’s worth investing some energy on that point; on point one. If you can spend some energy getting excited about something, then point two becomes easy and seamless. Anything that I’ve done that is amazing is usually where I was very interested. When I went out and got a job in the automotive industry to sell because I was 23 years old and I knew I was going to have a baby in the next year and I needed to increase my income, I was at least interested in cars. So it was easier for me to get involved in a job selling something that I knew a fair bit about and was automatically buying the local motor and wheels magazines and Road and Track. I aligned what I needed to do with something I was interested in. If you look at my online time, I was interested in sales and marketing and helping people. And the internet was a way that I could do that. So if you can’t get a workable resolution to point one; for example, if you’re trying to push yourself through a university course but you’re just not interested in it, or you’re trying to do a job that you’re just not interested in, then number two is actually unlikely to happen because point one is the precursor required for a great outcome. It’s the firewood for an amazing bonfire. So put in the work to gather the firewood and then the fire will be very easy because the more work you put into that firewood – setting it up properly and tipping some petrol on it – the bigger and brighter that flame will be with point two. It’s so easy to do something if you’re interested in it. Think about anything you do automatically that no one told you to do that you don’t have to do that you don’t even get paid to do. What is that you do? Is it – you go shopping, you play PlayStation, you ride your bicycle, you play chess – whatever it is that you do where no one is forcing you to do it, that’s something you’re interested in. See how powerful being interested in it is? So if you can put the energy into being interested in it, you’ll get a result. So I’m going to give you a tool for that. On my action list, which is very short, and it’s somewhere where I store ideas that I think I’d like to do, the top question that I ask myself is this: ‘This is interesting because?’ Now if I can answer that, if that prompt can result in me giving an answer, then I’m set. So for example, I need to get healthy. I want to stay fit. I want to be mentally aware. I want to meditate. Because we’ve heard all these things are good. I want to get good sleep. I want to eat well. I want to stay entertained and have fun. I don’t want to be the richest guy who’s desperately sad and sitting in my big mansion but unhappy. I want to be living and enjoying life at the same time being profitable. Of course, if you’re a member of SuperFastBusiness, you can have both. That is my full premise. I believe that you can work less and make more. I’m actually doing a whole book about this topic. You can pre-register for this book at the time of making this particular podcast. You can go to SuperFastBusiness.com/book. Enter your email address, and I’ll let you know when you can get that book. Because I think this book will change things for you. If you liked this podcast, certainly, you’ll like the rest of my book. Anyway, if I want to do all these things, if I want to be fit and have mental acuity and meditate and stay entertained, how can I make that interesting? This is interesting because I get to surf. I get to surf and have so much fun. And now I just want to go and do it. I’ve already surfed twice today, the day that I’m recording this podcast, because it’s so interesting. How can I make this interesting? That’s a good question to ask. Or this is interesting because… If you can align your interest with whatever it is that you need to get done, then doing it will be easy. I hope you’ve enjoyed this podcast. Let me know. I’m just sharing with you a revelation that really helped me. If you think it might help someone else, please share this podcast. If you feel compelled to, perhaps head over to iTunes and leave a little review and let other people who are browsing the Apple store know that this is a good podcast to listen to. I’m not going to spend hours on a podcast to share this simple message. 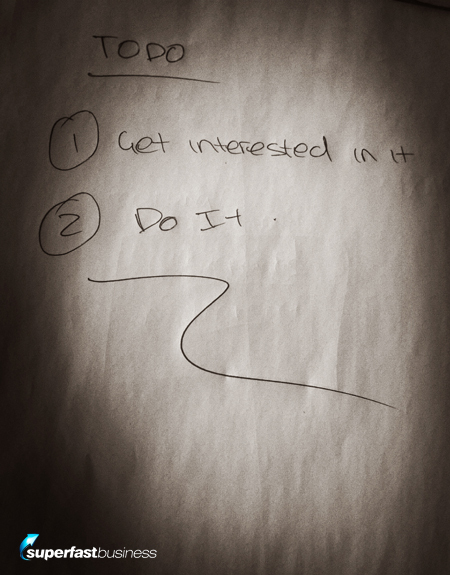 Please remember this two-step message to get anything done is simply just one: get interested in it – and two: do it. I think you’ll be more productive, and that’s why I don’t need a to-do list. I don’t need software to remind myself to do things because I just work with the things I’m interested in and I demolish those tasks. You can probably guess I’m very interested in podcasting, and that’s why we’re up to episode 557. I’m James Schramko. I hope to see you inside the SuperFastBusiness membership where I will personally coach you for the next year if you take an annual subscription.